After initial delivery this year, Bombardier plans to ramp up to as many as 40 Global 7500 deliveries in 2020. 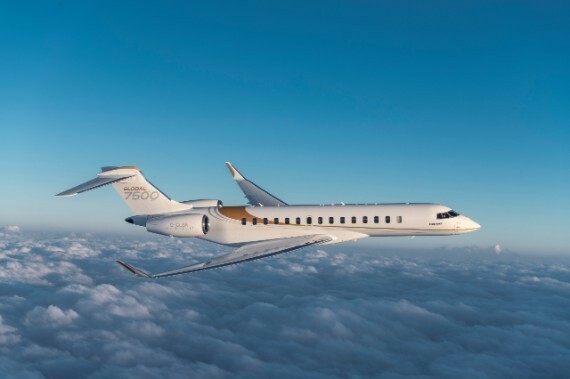 Bombardier, making plans to celebrate the handing over of the first Global 7500 “in the coming days,” expects to deliver between 15 to 20 of the model next year and then double production the following year. Bombardier Business Aircraft president David Coleal confirmed plans for the first formal delivery this year and outlined the anticipated 2019 and 2020 production plans while speaking December 6 during Bombardier’s Investor Day. Leading up to the investor event, Bombardier (Chalet A6, Static P7) released guidance that its business jet shipments would increase from an estimated 135 this year to between 150 and 155 next year and credited that jump in part to the ramp-up of the Global 7500. The bump in deliveries includes plans to hand over the first examples of the four-zone, 7,700-nm jets in the first half of 2019 with that growing to up to 15 in the second half, Coleal said, adding the company is taking a thoughtful approach to production to ensure a smooth flow and keep costs down. Plans call for Global 7500 deliveries to further increase to between 35 and 40 in 2020, with the program sold out through 2021. He added that Bombardier has all the components in-house for 2019 production and suppliers are already working to double their output for 2020. When asked about the wing, which was modified during the development program, Coleal reiterated that Bombardier has all the wings required to cover 2019 production. But he also noted, “We are actively working with our partner on a variety of topics, which could include in the long term what is the right place for the wing to reside…The biggest point is everyone is committed to the program ramp-up and committed to the long-term success of the program.” Triumph is the wing supplier. The 5500/6500 program, meanwhile, will also contribute to 2019 deliveries, with plans for the delivery of the first two to three in the latter half of the year, Coleal said. The flight-test program for the models, which were unveiled during the EBACE show in Geneva in May, is nearly three-quarters of the way through, he added. As for the entire portfolio, Coleal is encouraged by solid sales across all the product lines, including the Learjet 70/75 line, saying the smaller jets had a backlog though 2019. However, he maintained that Bombardier would remain cautious on production and would not boost rates until the company experienced multiple quarters of a book-to-bill of greater than 1.0.